Image: Money Cowrie, Monetaria annulus. 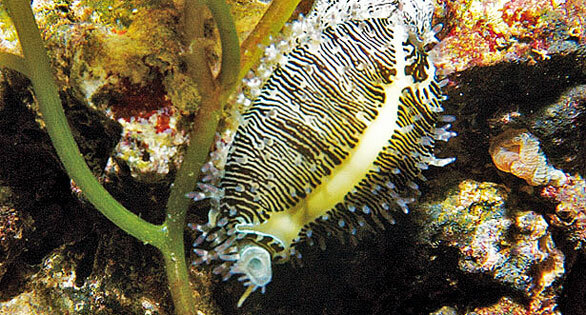 The image illustrating Reefkeeping 101 (CORAL Sept/Oct 2012, page 116) by Inken Krause was mistakenly identified as a Tiger Cowrie. It is, in fact, a smaller species, Monetaria annulus, that makes an excellent grazer for reef aquariums. The corrected page can be found in the Digital Edition of CORAL. Just got my new issue of CORAL, and on thumbing through it, and being a malacologist by profession (at one time, at least), I first took a look at the article about Tiger Cowries, Cypraea tigris. Unfortunately, the article is about money cowries (or annulated cowries, it is somewhat difficult to identify the animals by the images in the article). That species has a list of synonyms longer than my arm, but the most recent, and probably valid scientific name for it is Monetaria annulus, Linnaeus, 1758). REAL Tiger Cowries are well known in the hobby, commonly kept and sold. The common names for both money, annulated and Tiger Cowries have been around for at least a century due to shell collectors. The real quandary about Tiger Cowries is why they are named tiger in the first place, as they are spotted not striped. Editor’s Note: Dr. Shimek is the author of The Pocket Expert Guide to Marine Invertebrates (Microcosm/TFH, 2004).